In Navajo Chinde means unwelcome ghost or evil spirit. Think of the pre-dinosaur era when giant reptiles and amphibians ruled. Chinde Point is notable for an important archeological find. In 1984 he fossil bones of a very early, small (4 ft tall) dinosaur were discovered. Named chindesaurus bryansmali, this is the only known specimen of this type of dinosaur. Chinde Point is the 5th overlook you may stop at and 2.3 miles into the park. 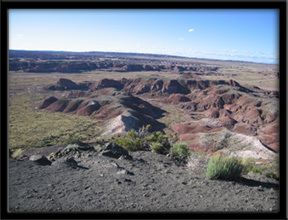 When you are touring Petrified Forest National Park make note that picnic facilities and restrooms are located here. This entry was posted in National Parks, Petrified Forest and tagged Arizona, Chinde Point, chindesaurus bryansmali, dinosaur, Navajo, Painted Desert, Petrified Forest National Park, scenic overlook. Bookmark the permalink.